The Aston Valve Company made valves for various steam car companies, including Stanley. Ashton Valve Company Magazine Advertisement. Horseless Age, April 25, 1900. 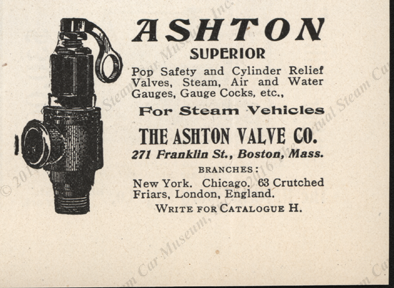 Ashton Valve Company Magazine Advertisement. Horseless Age, November 29, 1905. Ashton Valve Company Magazine Advertisement, Cycle and Automobile Trade Journal, November 1907, p. 392. Contact us if you have additional information about the Ashton Valve Company, or if you have questions.